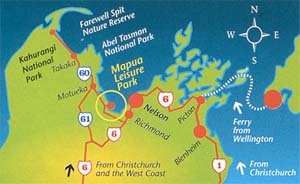 We are conveniently close to Nelson City and the airport and a short drive to the National Parks. Mapua Leisure Park is now more accessable with the NEW low airfares from Wellington, Palmerston North and many more popular places. There are excellent Coachlines that also feed Mapua. There is now a choice of FAST ferries operating across Cook Strait so there is no reason to leave the car at home.